With so many political changes in the world it is quite surprising that the economy in many markets is stable. At the latest meeting of the International Association of Concrete Drillers and Sawers in Vienna, the majority of the member associations from all corners of the world said that their concrete cutting businesses were doing very well. The need for new housing and commercial buildings is still strong in many markets and this trend is believed will continue and probably also next year. However, in Europe there is concern due to the unexpected result of the recent general election in the UK. The fact that the UK’s conservative party did not strengthen its position, which it hoped for, could possibly make the Brexit negotiations more difficult. Even so the process of the UK leaving the European Union will be completed by the end of March 2019, whether a deal is reached or not, and during this period we can expect uncertainty from both parties. The UK is a very important market for many manufacturers of demolition, concrete cutting, dust extraction, concrete floor grinding and polishing and mobile recycling equipment. I believe UK manufacturers are hoping for a swift negotiation so the effects on exports and imports will not be too damaging. By the time you read this issue the Brexit divorce negotiations between the two parties will have started. It is believed from the EU that any possible plans of a re-marriage can be discussed before the divorce is settled. The UK has gone through a very difficult and sad period recently due to the political situation, the terrible terrorist attacks and the tragic London tower block fire, where many people have been killed and severely injured. Our thoughts and prayers are with the British people at this difficult time. 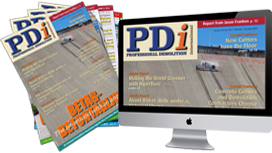 This issue of PDi contains many interesting articles and special features, for example, on mini excavators and dust extraction and wall sawing equipment. There is also a report from the IACDS meeting. I also would like to take this opportunity to thank our readers, advertisers and contributors for your encouragement and support during the first half of 2017. I wish you a pleasant and relaxing summer vacation and continuous prosperity in the second half of the year.